TravelMate - Ace Leather Goods, Inc. The TravelMate comes in a single strap version that can be easily worn over your shoulder or the double strap version that can be worn as a backpack. The TravelMate has two separate main compartments with several inside organizational pockets. Between the two mains compartments there is a concealment pocket that is lined with rip-stop nylon. This is the perfect space to carry a water bottle or other items you want to keep separate from the rest of your bag. The rip-stop nylon prevents any accidental spills from damaging the rest of your bag. This bag is made to keep your valuables secure. When wearing the bag the zipper lies against your back and becomes inaccessible from any one walking behind you. The only pocket that is accessible is sealed using Velcro so you will feel it if someone is trying to get into your bag. The straps for the TravelMate are fully adjustable. The TravelMate comes in Extra Small to Large to accommodate people’s different heights and body types. These bags are designed to be unisex. Which TravelMate Is Right For You? There are several things to consider when choosing which of our two designs is right for you. Below are some things to consider when choosing a style and size of the bag. Make sure to check out our video as well which will show you how to wear the bag as well as highlight its features. Extra Small: This size is ideal for someone looking to replace a regular sized purse. There is plenty room to carry everything you would generally carry using a purse. Medium and Large: This size is great if you need to carry a few larger items such as small electronics, digital cameras, books, and more. Extra Large: The Extra Large is just that very large. Women use this bag as an extra large purse when flying with the increasing restrictions on carry-on luggage. It also works great as a camera bag, providing room for extra lenses. 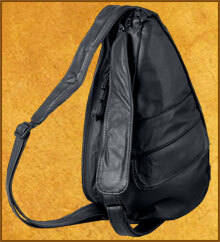 For those of you with concealed weapons permits the concealment pocket in this size bag can accommodate most pistols. If you travel a lot, internationally or otherwise, we would suggest the Backpack TravelMate. The second adjustable strap makes it easier to wear the bag in different ways to increase your comfort. The additional strap also makes the bag very secure. The second strap can be used as a waist strap and allows you to wear the bag under your arm. Both styles of bags are suitable for carrying a laptop. The medium and large sizes can carry a smaller laptop, while the extra large can carry up to a 15” laptop. Both styles work well, medium and up can easily accommodate standard paper sizes of 8.5” x 11”. Both styles are designed to be very secure. The second strap of the Backpack TravelMate adds extra security when the second strap is worn around the waist and the bag is carried under your arm. To see how the bag is used this way check out the video. Carrying Books - Both styles can carry books well. We recommend the backpack version since it can be worn several different ways. If you use this bag correctly, you will absolutely love it! Here are some helpful hints. Remember to wear your TravelMates with the zippers going up and down your back. This adds security by having the zippers against your body. Positioning of the TravelMate on your body is essential to getting the best benefit from this shoulder bag. Play with your TravelMate a few times adjusting the strap to the shortest position that allows the bag to rest on your hip and against your back with the narrowed end at your shoulder. Do not let it sag under the arm like a traditional purse if this happens your neck and shoulder will be bearing all the weight. Use your pockets. This helps distribute the load and keeps your things from concentrating in a lump in the bottom of your bag. It may take a few times of trying different things in different places but if you can make use of the pockets, your bag will be more balanced and organized! Your TravelMate opens with the zippers moving up and down. The narrowed end of your bag is the top and the wider gusseted end is the bottom. Always grab the bag towards the top. When you set it down set it resting on it's bottom with the zipper running straight up and down not horizontally across the top. This will keep your things in the pockets. If you grab the bag at the bottom end and then open it, the purse is in effect upside down and everything will dump out of the pockets. When you open it properly, everything will be where it should be and you will not believe how organized you will become. To open your bag while wearing it all you have to do is grab the bottom and pull it forward under your arm. Always leave the zipper sliders on the bottom of your bag; this allows for easy access to your zipper and it will be easy to slide open. When you open it, everything is right there. You are in the bottom of your bag and you can easily see everything. Wear your TravelMate across your body. You can also extend your strap all the way making this bag ideal to wear over your head and across your body. This in effect acts like a sling bag. Notice the zipper is still secure against your body, in this position nobody can get in without you noticing. To access the zipper you just pull the whole bag under your arm and again the zipper is right there. The advantage to this is that you are free to move and you do not have to take the bag off to get into it as you do with most sling bags. The TravelMate will stay on most shoulders better than any other traditional purse. If by chance your bag tends to slip, do not tolerate it, we have found an easy solution: Dr. Scholl's heel liners available at most grocery or drug stores. They come in a package of two and are padded and self-adhesive with a non-slip surface that is perfect for the inside of any purse strap. As with all of our leather, your bag is made with tanned cowhide and is lightweight and weather resistant. To clean your bag, use any mild soap and water or Murphy's oil soap found in any grocery store mixed with water. You should not worry about the durability of your bag for weather or regular usage. Just use it! We want to congratulate you on making a great choice! We know that you will be very happy with your new TravelMate.